MOUNTAIN VIEW, California, September 25, 2012 (ENS) – California Governor Jerry Brown today took a test ride in a self-driving car before signing into law new safety standards and regulations for the autonomous vehicles. The law takes effect on January 1, 2013. Governor Brown said the bill paves the way for the new technology that could reduce highway fatalities, pollution and congestion while expanding mobility options for elderly and disabled people. Senate Bill 1298 by Senator Alex Padilla, a Democrat, allows driverless cars to be operated on public roads for testing purposes, provided that each vehicle has a fully licensed and bonded operator in the driver’s seat to take control if necessary. The bill instructs the Department of Motor Vehicles to adopt regulations that govern the licensing, bonding, testing and operation of autonomous vehicle technology. The governor signed the bill in a ceremony at Google’s headquarters in Mountain View because Google’s fleet of autonomous vehicles has already logged 300,000 test miles on California’s roads and highways. “Governor Brown’s signature today represents an opportunity for our state to lead the nation in driverless vehicle technology,” said Padilla. In just 28 years, driverless, autonomous vehicles will account for up to 75 percent of cars on the road, according to the Institute of Electrical and Electronics Engineers. Members of IEEE, which calls itself the world’s largest professional organization dedicated to advancing technology for humanity, earlier this month selected autonomous vehicles as the most promising form of intelligent transportation. The increased use of driverless cars will be the catalyst for transforming vehicular travel over the next 28 years, changing traffic flows, intersections, highways and eliminating the need for drivers’ licenses, the IEEE members predict. 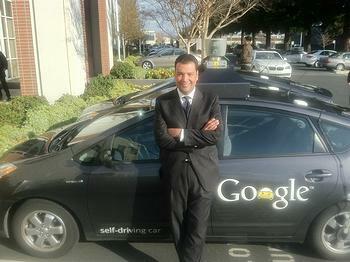 Driverless cars operate using sophisticated, communicating sensors to ensure safe, efficient travel. Through vehicle-to-vehicle and vehicle-to-infrastructure communication there may be no need for traffic lights and stop signs when all of the cars on the road are driverless. “Intersections will be equipped with sensors, cameras and radars that can monitor and control traffic flow to help eliminate driver collisions and promote a more efficient flow of traffic. The cars will be operating automatically, thereby eliminating the need for traffic lights,” said Alberto Broggi, IEEE senior member and professor of computer engineering at the University of Parma in Italy. No stranger to autonomous vehicles, Dr. Broggi was the director of a 2010 project that enabled two driverless cars to successfully complete an 8,000-mile road trip, traveling from Parma to Shanghai. Highway travel would be vastly different than it is today. Autonomous and traditional vehicles would each have their own designated lanes, minimizing traffic jams, increasing efficiency and allowing for speeds up to 100 miles per hour. “Through use of dedicated lanes on the highway, it will provide more streamlined flows of traffic, which will make the transportation with these vehicles more energy efficient,” said Dr. Azim Eskandarian, IEEE member and director of the Center for Intelligent Systems Research, at George Washington University in Virginia. “This new traffic flow, coupled with the increase of automated travel, will also enable cars to travel more safely while going faster and perhaps with closer gaps in between them, while platooning (or using autonomous features), specially at free-flow traffic,” said Eskandarian. IEEE members predict that autonomous vehicles will make car sharing programs more prevalent. A driverless car will pull up, carry a passenger to his or her destination and then be ready for the next user. “Since cars today are parked for more than 90 percent of their lifetime, shared car services will promote more continuous movement, garner more efficient operation and use less gas,” explained Broggi. Driverless vehicle sharing programs will enable people of all ages and abilities to utilize these vehicles, eliminating the need for driver’s licenses, the IEEE members believe. The IEEE visionaries acknowledge that driver and passenger acceptance are the greatest barriers to widespread adoption of driverless cars. “Drivers and passengers are hesitant to believe in the technology enough to completely hand over total control,” said Jeffrey Miller, IEEE member and associate professor in the Computer Systems Engineering department at University of Alaska, Anchorage.